St Cuthbert’s Church was blessed for use on 18th October 1870 and therefore in 2020 we will celebrate the 150th anniversary of the church building. The Parochial Church Council (PCC) are taking this occasion to bring about a number of much needed improvements at the back of the church. This includes the installation of a toilet, servery and storage cupboard. In order for this to be done the old font will be removed and a new smaller font will be commissioned for use. PCC believe the church should be at the heart of the community. St Cuthbert’s is in a prime location behind Queen Street and next to bus stops. A ramp has already been installed to allow easy access for wheelchair and pushchair users. Many visitors as well as locals use St Cuthbert’s for a variety of occasions. The lack of basic amenities has caused difficulties for some people. Contemporary needs have been identified which include a toilet with access for disabled, a servery where light refreshments can be served and a storage area to house tables and chairs. These would conform to modern health and safety standards. PCC wish to make the church building fit of purpose in the 21st century. There has been much background investigation undertaken. The history of the church has been looked into and expert bodies consulted. The advice of Archdeacon of Lindisfarne has been sought. Various possibilities have been tabled and discussed. PCC have employed a church architect to draw up these proposed plans. 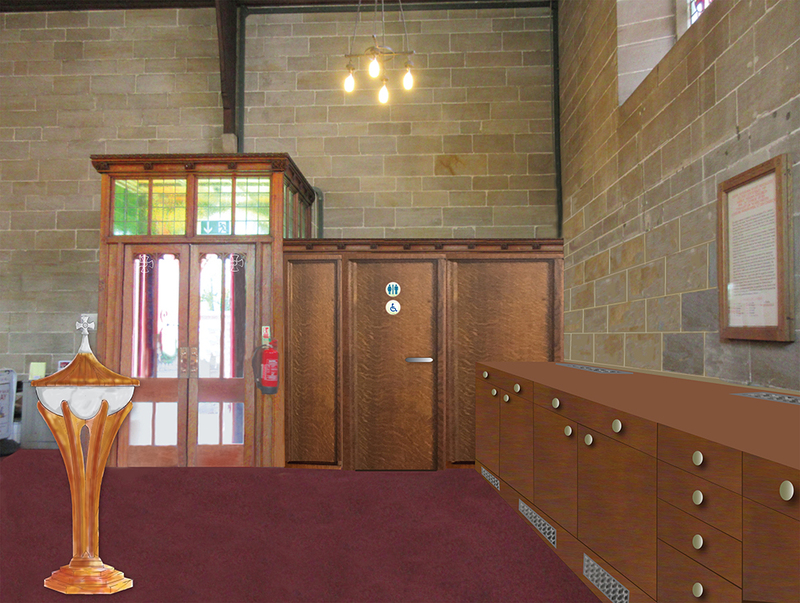 We have tried to ensure the main structure of the church is not disturbed; that disruption is kept to a minimum; the new furniture fits into the general architectural scheme of the building; the new installations are of good quality and will be a future asset. The architect took our suggestions to the Diocesan Advisory Committee. This is a group which is involved with the care of church buildings. DAC members are experts in their field. Members include representatives of local authorities as well as church officials. DAC have been considering the PCC’s proposed changes. In the course of their deliberations DAC sought advice from a number of expert bodies including Historic England, The Ancient Monument Society, The Victorian Society and The Church Buildings Council. At a recent meeting in September this year DAC have supported the PCC proposals. 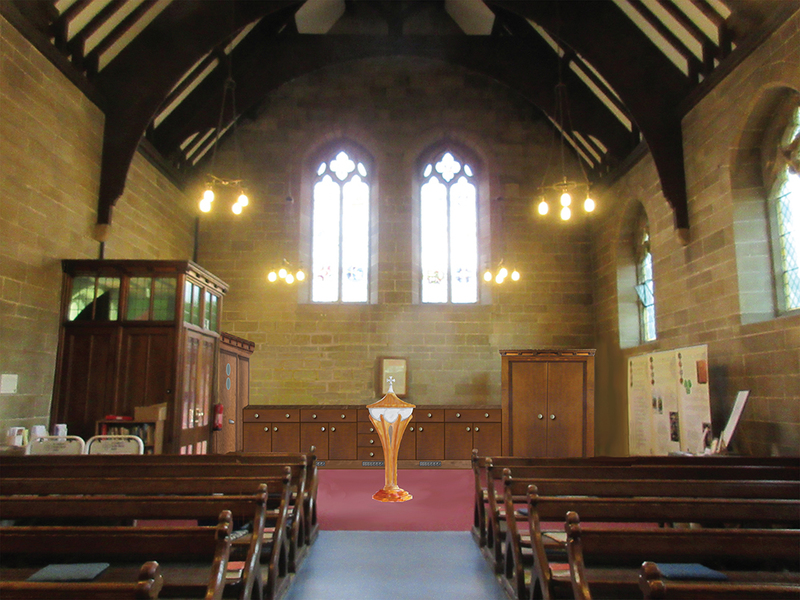 A consultation meeting was held in August after architectural plans and photomontage had been displayed in church to show what the proposals entailed. There has been a Comments Box available for members of the church and of the community to express their views. The box will remain in church for a further month. The Vicar will read all comments. One of the most contentious issues is the removal and disposal of the existing font. It is very large with a huge stone plinth that is a trip hazard. A number of people have tripped on this which is over 2 metres long. The architect has advised that there are internal salt problems as the stone is rapidly fracturing. Stone masons have advised that due to the deterioration of the stone the font is likely to break up on removal. Furthermore, there are very strict regulations on how a redundant font may be disposed. We have identified a void beneath the floor at the rear of church where the removed old font could be permanently housed; thus, still remaining within consecrated grounds. The Archdeacon has expressed his satisfaction with this proposed solution to the matter. As a result of the DAC recommendation the PCC is now in a position to seek a Faculty, that is the legal permission to bring about the proposed changes. A notice about this will be placed in the church. Everyone has an opportunity to raise concerns or to comment by writing to the Chancellor of the Diocese. These comments will be taken into consideration when the Faculty application is considered. Great care is taken in considering such proposals and I expect the Bishop of Newcastle will be involved in this decision. The overall costs of all these works is in the region of £60,000. The architect is busy with building tenders. PCC members have already pledged £5,500 towards the scheme. If the faculty is granted we will need to do some fund raising. We hope that members of the community will assist us in this task. We have already received some useful advice on this. Assuming the Faculty is granted we hope the work to begin later in 2019. It will probably take about four weeks to complete. Church services may have to be temporarily held in the church hall during this time. We would hope the work was complete for our anniversary year, 2020. I am asking everyone and anyone to consider these proposed changes. We will endeavour to ensure the church building is kept open and fit as a spiritual sanctuary for the benefit of the community and at the service of our God. Please keep all these matters in your prayers. And as always, I pray that the Lord will continue to bless and guide all of us here in Amble.